Nonprofit marketers are using more content marketing tactics, social media platforms, and paid methods of content promotion than last year – and, generally speaking, they’re becoming more effective in many of these areas, and in particular, with how effectively they use tactics. Yet, in terms of overall effectiveness, only 26% say they’re effective – a drop from last year when about one-third of marketers said they were effective. 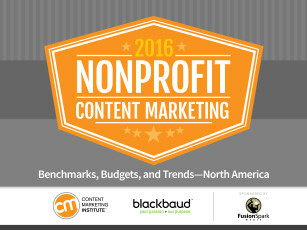 Our new report, Nonprofit Content Marketing 2016: Benchmarks, Budgets, and Trends – North America, produced in association with Blackbaud and sponsored by FusionSpark Media, reveals this insight and much more. In this year’s annual content marketing survey, which generated the results of our new nonprofit report, we dug deeper into attributes that could affect an organization’s content marketing effectiveness. Here are some of the results and tips on how your nonprofit may be able to take steps to improve your content marketing. This is the second year we’ve asked marketers if they have a documented content marketing strategy. We’ve learned that having a documented strategy is a key differentiator among those who say their content marketing is effective and those who rate theirs as less effective. Of those who have a documented content marketing strategy, 42% say they are effective. 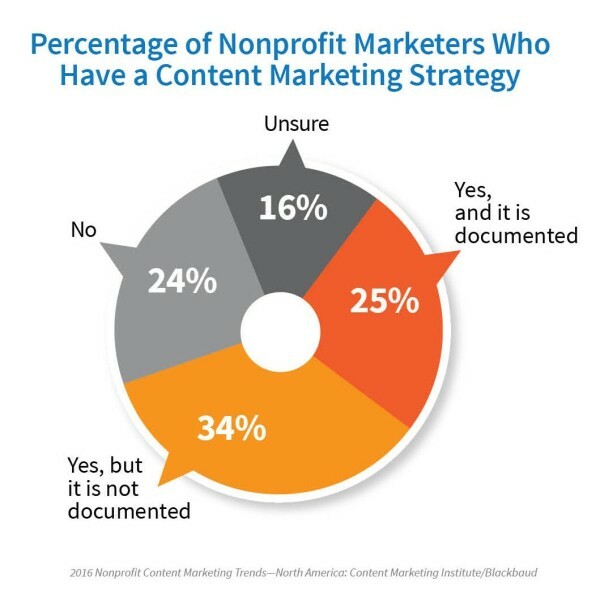 My commentary: About one-third of nonprofit marketers say they have a content marketing strategy but it isn’t documented. As I do when I review our B2B and B2C research, I question how effective these strategies are if they’re only verbal. If the strategy isn’t documented, how can you properly share and communicate to others on your team and in your organization? In our experience, having a strategy that is not written down and shared is like having no strategy at all. Download our 16-page guide to learn how to document your content marketing strategy. 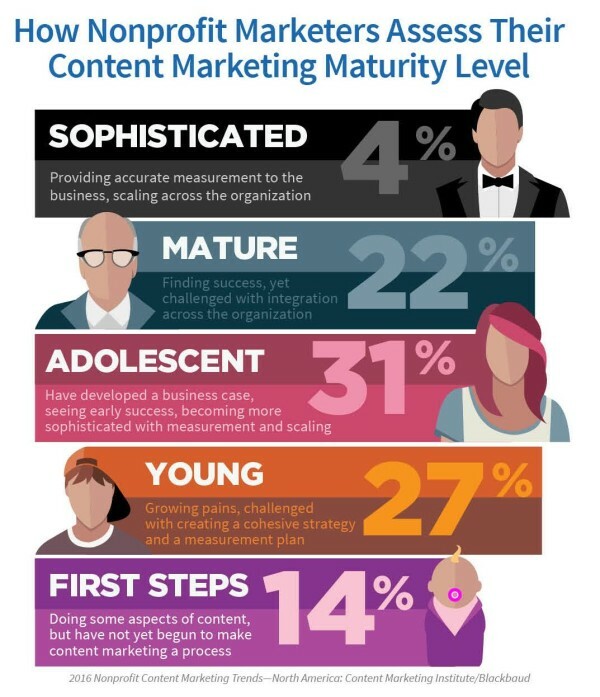 Not surprisingly, an organization’s content marketing maturity level makes a difference – 55% of those who identify their organization’s content marketing as sophisticated or mature say they’re effective. My commentary: Our question about maturity is new year, so we don’t have trends, but we did see a large jump in the percentage of nonprofit marketers who reported using content marketing – from 61% to 76% – and chances are many of these “newbies” are involved with content marketing programs in the early stages of maturity. Of the 41% of marketers who identify their programs as belonging to the young and first-steps phases, only 12% consider their programs to be successful. Engaging your content marketing team through meetings also can make a difference – it can be an opportunity to reiterate strategy, discuss tactical execution, understand what’s successful, know the challenges that arise, make adjustments, and ensure everybody is on the same page. 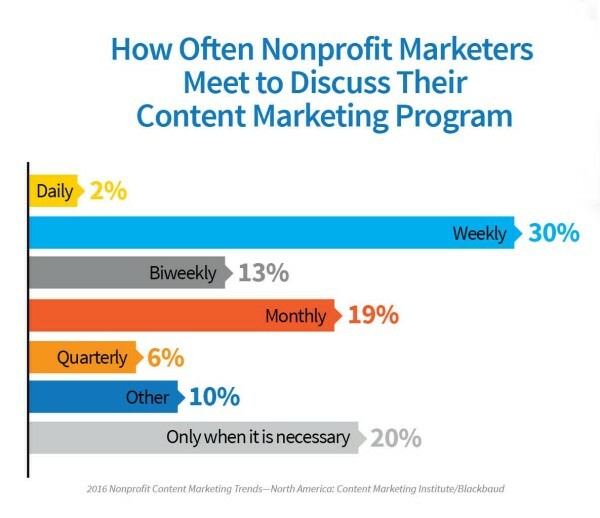 Half of the most effective nonprofit marketers meet daily or weekly to discuss their content marketing programs (24% of the least effective meet daily or weekly and an additional 24% of the least effective meet only when necessary). My commentary: Half of effective marketers meet at least weekly. The point isn’t the volume of meetings, it’s that you need to think about how your content marketing team is communicating, and be deliberate about what you discuss and how frequently you engage each other to talk about your strategy. Teams that meet more often are more likely to identify content gaps or areas of unnecessary duplication. An editorial mission statement clearly defines who your audience is and how your content will help it. 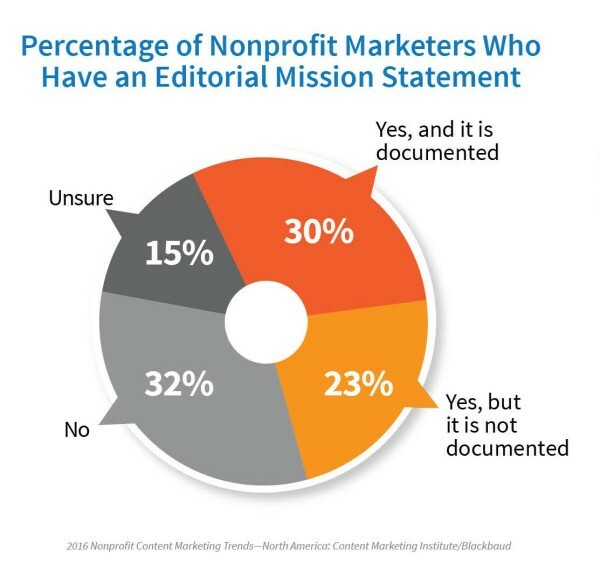 For the first time, we asked nonprofit marketers if they have documented editorial mission statements, and 30% said they do. Of the most effective marketers, 42% have such a statement, while only 21% of the least effective have one. My commentary: While your documented content marketing strategy is important, there is something exceptionally meaningful about documenting your editorial mission, which I often also refer to as your content marketing mission statement. If there is one thing that marketing leaders need to do today, it’s crafting your editorial mission statement to address who you are helping, how you will help them, and what the outcome will be. This mission needs to be front and center for everyone who creates content for your business. If a piece of content does not support this, chances are you should not publish it. 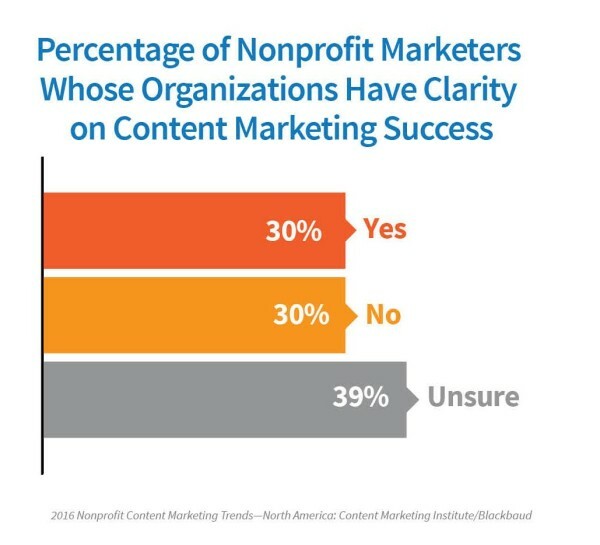 Unfortunately, documentation and effectiveness do not automatically create clarity – 61% of the most effective nonprofit marketers say they have clarity on what successful content marketing looks like within their organization. Not surprisingly, almost 90% of the least effective say they have no clarity or are unsure if they have clarity in their organization. My commentary: While I am not surprised that the least effective marketers don’t have clarity of vision, I do find it surprising that around 40% of effective marketers don’t know what success looks like within their organization. I’m curious how a nonprofit can be successful with content marketing if they don’t know what success looks like. Create clarity – Ensure your content marketing strategy also documents what success or effectiveness looks like in your organization. Incorporate measurable benchmark goals for specific tactics as well as the overall strategy. Communicate regularly – Get your team together to talk about what’s happening, what challenges arise, and what adjustments might be necessary. Consider implementing a project management system that requires ongoing communication on progress. Don’t forget to communicate the vision, strategy, and success clarity to all involved – from the C-suite to external partners. Update them on a regular basis. Want to become more effective in your content marketing strategy and tactics? Get the latest research, tips, tools, and more, subscribe to our blog posts.